NGO Sira iha Timor leste. Women's Community NGOs in Timor Leste. There is a wide network of community NGOs in Timor-Leste, ready to help women and strive for change. Hanesan rede ida ne'ebé oin-oin kona-ba NGO sira iha Timor-Leste, prontu atu ajuda no hakaʼas an ba mudansa. Rede Feto is the peak body of a network of women’s organisations working to promote gender equality and women’s empowerment in Timor-Leste. Rede Feto mak órgaun altu ba rede organizasaun feto sira-nia servisu hodi promove igualdade jéneru no hakbi'it feto nian iha Timor-Leste. Caucus aims to increase gender equity in politics by strengthening the involvement of women in the democratic process, empowering and motivating women in political life, and promoting women’s leadership. Caucus objetivu atu hasa'e igualdade jéneru iha politika hodi hametin involvimentu feto iha prosesu demokrátiku, valoriza no motiva feto iha vida polítika, no promove feto nia lideransa. FEEO works on violence prevention through creating linkages with government and other institutions in training of local men & women leaders. FEEO servisu sira kona-ba prevensaun violénsia liuhosi kria ligasaun ho governu no instituisaun sira seluk iha formasaun kona-ba lider lokal sira mane & feto. FMF was established in 2013 in Lliquica municipality. It builds local leadership, in both civil society and government systems and works to strengthen the Liquiça community. FMF harii iha tinan 2013 iha munisípiu Lliquica. Nia harii lideransa lokal, iha sistema governu no sosiedade sivil no obras atu haforsa komunidade Liquiça. 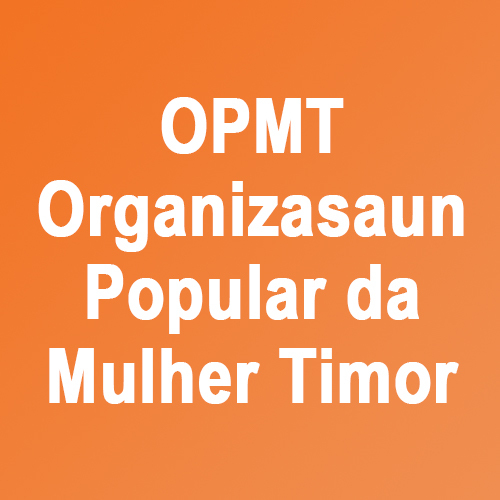 OPMT, established in 1975, is one of the longest running and most extensive women’s development structures in Timor-Leste, focused on the emancipation of women in all aspects of life, particularly through education and community organising. OPMT, ne ' ebé estabelese iha tinan 1975, mak ida husi estrutura dezenvolvimentu parseria kontínuu halai no maka'as liu feto nian iha Timor-Leste nian, ne'ebé foka ba emancipation kona-ba feto sira iha aspetu hotu-hotu moris nian, liu-liu-liu husi edukasaun no komunidade sira ne ' ebé resenseamentu nian. APSC-TL is a women’s advocacy organisation focused on education, peace building and economic empowerment in Timor-Leste. APSC-TL ne'e foka liu kona-ba edukasaun, harii paz no empoderamentu ekonómiku iha Timor-Leste organizasaun advokasia nian ba feto ida. Centru Nossa Senhora do Rosario does capacity building with women in the Municipalities of Ermera and Manatutu. They assist orphans with schooling and visit families who need material support with education. Centru Nossa Senhora do Rosario halo kapasitasaun ho feto sira iha Munisípiu Ermera no Manatutu. Sira ajuda oan ho eskola no vizita sira-nia família ne ' ebé presiza apoiu materiál sira ho edukasaun. FHF advises and supports women to know and seek economic independence. They have programs in Horticulture, Agriculture, Micro Credit Loans scheme and well as in developing and promoting local food Products. FHF hatete no fó apoiu ba feto atu hatene no buka independénsia ekonómika. Sira iha programa iha Ortikultura, Agrikultura, rejime Mikro Kreditu, no mós iha dezenvolvimentu no promove ai‐han lokal Produtu. GFFTL was founded in 1998 as a student organisation to work with young women in the rural areas. GFFTL harii iha tinan 1998 hanesan organizasaun estudante ida atu serbisu hamutuk ho feto klosan iha área rurál. Psychosocial Recovery and Development in East Timor (PRADET) provides psychosocial services for people who have experienced trauma, mental illness, domestic violence, sexual assault, child abuse abandonment, trafficking, imprisonment and torture. Rekuperasaun no Dezenvolvimentu iha Timor-Leste (PRADET) atu fornese servisu psikososiál ba ema neʼebé iha ona esperiénsia trauma, moras mental antes, violénsia doméstika, ásaltu, labarik abuzu abandono, tráfiku umanu, dadur no tortura. Founded in 2001 by Ms Kirsty Sword Gusmao, the Alola Foundation seeks to nurture women’s leadership and advocate for the rights of women. Harii iha tinan 2001 hosi Sra Kirsty Sword Gusmão, Fundasaun Alola buka atu estimula feto nia lideransa no advokasia ba feto nia direitu. Estrela + is the national network for people living with HIV in Timor-Leste. Estrela+’s objective is improving the quality of life for all people living with HIV in Timor-Leste. Estrela+ is run by positive people for positive people. Estrela + mak rede nasionál ba ema moris ho HIV iha Timor-Leste. Estrela + nia objetivu mak hadi'a kualidade moris ba ema hotu-hotu ne ' ebé moris ho HIV iha Timor-Leste. Estrela + mak regula hosi ema ne ' ebé pozitivu ba ema sira ne ' ebé pozitivu. FKSH work to build the capacity of women in small business, to achieve rights and dignity for women and to organise women’s activities for independence, self esteem & empowerment. FKSH serbisu atu harii kapasidade feto iha negosiu ki'ik sira, atu hetan direitu no dignidade ba feto no atu organiza atividade feto sira-nia independénsia, auto-estima & empoderamentu. HAFOTI is a lead economic empowerment organisation based in Dili working with rural women from seven Municipalities around the country to improve their income generation by supporting small business development. HAFOTI mak lidera empoderamentu ekonómiku organizasaun ida ne ' ebé bazeia iha Dili ne ' ebé serbisu ho feto husi Munisípiu hitu iha nasaun sira atu hadi'a sira nia rendementu hodi apoia dezenvolvimentu negosiu ki'ik iha área rurál.